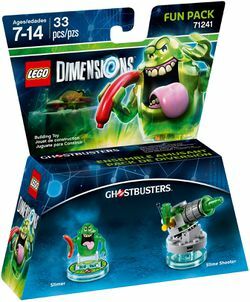 71241 Slimer Fun Pack is a Dimensions set released on May 10, 2016. 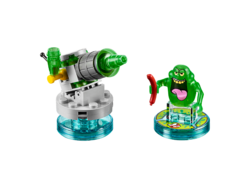 The set features a Slimer minifigure and a Slime Shooter. This is a description taken from LEGO.com. Please do not modify it. (visit this item's product page) Slime your enemies with Slimer from Ghostbusters™! Let creativity be your guide to a building and gaming adventure—journey through unexpected worlds and team up with unlikely allies on a quest to defeat the evil Lord Vortech. Construct this glutinous ghost and represent the Ghostbusters™ in a crazy mash-up multiverse of your favorite characters! Place Slimer on the LEGO® Toy Pad to bring him to life in the game. Fire his hot dog and activate his Boomerang, Sonar Smash, Flying, Dive, Hazard Clean, Illumination, Mini Access and Hazard Protection abilities to solve puzzles and battle enemies. When he needs backup, call in the Slime Shooter and rebuild it into a Slime Exploder and Slime Streamer for upgraded powers in the game! Includes a buildable Slimer figure with his hot dog and 3-in-1 Slime Shooter, both with a detachable LEGO® Toy Tag. Place Slimer and his 3-in-1 Slime Shooter on the LEGO® Toy Pad and set out on exciting in-game adventures. Collect your favorite LEGO®DIMENSIONS™ characters and use them in-game together for a crazy mash-up multiverse. Visit LEGO.com/DIMENSIONS for more information on this exciting LEGO® building and video-gaming experience. Ask your parents' permission before going online. Slime Shooter measures over 1” (5cm) high, 1” (5cm) wide and 1” (3cm) deep (alternative 3-in-1 vehicle builds vary in size). Facts about "71241 Slimer Fun Pack"